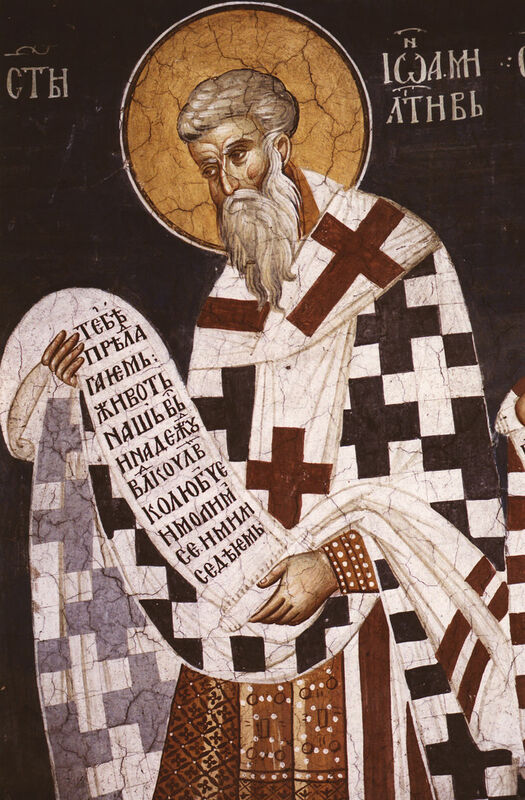 Saint John the Merciful, Patriarch of Alexandria, was born on Cyprus in the seventh century into the family of the illustrious dignitary Epiphanius. At the wish of his parents he entered into marriage and had children. When the wife and the children of the saint died, he became a monk. He was zealous in fasting and prayer, and had great love for those around him. His spiritual exploits won him honor among men, and even the emperor revered him. When the Patriarchal throne of Alexandria fell vacant, the emperor Heraclius and all the clergy begged Saint John to occupy the Patriarchal throne. The saint worthily assumed his archpastoral service, concerning himself with the moral and dogmatic welfare of his flock. As patriarch he denounced every soul-destroying heresy, and drove out from Alexandria the Monophysite Phyllonos of Antioch. He considered his chief task to be charitable and to give help all those in need. At the beginning of his patriarchal service he ordered his stewards to compile a list of all the poor and downtrodden in Alexandria, which turned out to be over seven thousand men. The saint ordered that all of these unfortunates be provided for each day out of the church’s treasury. Twice during the week, on Wednesdays and Fridays, he emerged from the doors of the patriarchal cathedral, and sitting on the church portico, he received everyone in need. He settled quarrels, helped the wronged, and distributed alms. Three times a week he visited the sick-houses, and rendered assistance to the suffering. It was during this period that the emperor Heraclius led a tremendous army against the Persian emperor Chosroes II. The Persians ravaged and burned Jerusalem, taking a multitude of captives. The holy Patriarch John gave a large portion of the church treasury for their ransom. The saint never refused suppliants. One day, when the saint was visiting the sick, he met a beggar and commanded that he be given six silver coins. The beggar changed his clothes, ran on ahead of the Patriarch, and again asked for alms. Saint John gave him six more silver coins. When, however, the beggar sought charity a third time, and the servants began to chase the fellow away, the Patriarch ordered that he be given twelve pieces of silver, saying, “Perhaps he is Christ putting me to the test.” Twice the saint gave money to a merchant that had suffered shipwreck, and a third time gave him a ship belonging to the Patriarchate and filled with grain, with which the merchant had a successful journey and repaid his obligations. Saint John the Merciful was known for his gentle attitude towards people. Once, the saint was compelled to excommunicate two clergymen for a certain time because of some offense. One of them repented, but the other fellow became angry with the Patriarch and fell into greater sins. The saint wanted to summon him and calm him with kind words, but it slipped his mind. When he was celebrating the Divine Liturgy, the saint was suddenly reminded by the words of the Gospel: “If you bring your gift to the altar and remember that your brother has something against you, leave your gift before the altar ... first, be reconciled with your brother, and then come and offer your gift” (Mt. 5:23-24). The saint came out of the altar, called the offending clergyman to him, and falling down on his knees before him in front of all the people he asked forgiveness. The cleric, filled with remorse, repented of his sin, corrected himself, and afterwards was found worthy to be ordained to the priesthood. There was a time when a certain citizen insulted George, the Patriarch’s nephew. George asked the saint to avenge the wrong. The saint promised to deal with the offender so that all of Alexandria would marvel at what he had done. This calmed George, and Saint John began to instruct him, speaking of the necessity for meekness and humility. Then he summoned the man who insulted George. When Saint John learned that the man lived in a house owned by the church, he declared that he would excuse him from paying rent for an entire year. Alexandria indeed was amazed by such a “revenge,” and George learned from his uncle how to forgive offenses and to bear insults for God’s sake. Saint John, a strict ascetic and man of prayer, was always mindful of his soul, and of death. He ordered a coffin for himself, but told the craftsmen not to finish it. Instead, he would have them come each feastday and ask if it was time to finish the work. Saint John was persuaded to accompany the governor Nicetas on a visit to the emperor in Constantinople. While on his way to visit the earthly king, he dreamed of a resplendent man who said to him, “The King of Kings summons you.” He sailed to his native island of Cyprus, and died at Amanthos, the saint peacefully fell asleep in the Lord (616-620). By endurance you gained your reward, venerable Father; / you persevered in prayer unceasingly; / you loved the poor and provided for them in all things. / Blessed John the Merciful, intercede with Christ God that our souls may be saved. You distributed your wealth to the poor / and in return obtained wealth from heaven, John the Merciful. / Therefore, we honor you and celebrate your memory, O namesake of mercy.